New equipment enhances resident lifestyle and promotes independence. Autumn’s Promise, a top assisted living facility in Green Bay, invests in a computer system able to adapt to each resident’s unique needs and interests! Autumn’s Promise recently purchased It’s Never 2 Late (iN2L), a computer system that offers seniors the opportunity to interact with activities adapted to their abilities and needs. The system promotes dignity through cutting-edge technology. Autumn’s Promise residents are able to work on occupational, physical and speech enhancement, improving balance, memory, coordination, strength and more. The software is easy-to-use, with a picture-based interface. In a world where technology plays a role in nearly every aspect of daily life, Autumn’s Promise believes it is important to keep residents connected—to offer a tool for seniors to communicate and socialize with family and friends. 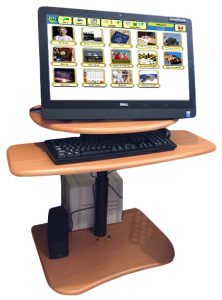 Our seniors are able to use this system to stay in touch with others through video chat and user-friendly email. Socialization is especially important as we age, so this is another opportunity to engage our residents as they benefit from the system’s many programs and activities. As we age, it’s common to want to remain as independent as possible. While health conditions may demand the need for assisted living care, it doesn’t mean seniors can’t continue living a rewarding life with dignity and respect. At Autumn’s Promise, we offer the personalized care our residents need while making sure they have every opportunity to enjoy life to the fullest.